The average RV owner spends between 3 and 4 weeks camping each year. And with good reason: you’re able to experience nature without giving up the creature comforts you love. With that much use, it’s normal for every RV to need a bit of TLC every now and then. But if you’re new to RV ownership or haven’t thought about maintenance before, where do you start? Before you rush to the dealership and let their experts get your camper ready for the season, see what you can do yourself! 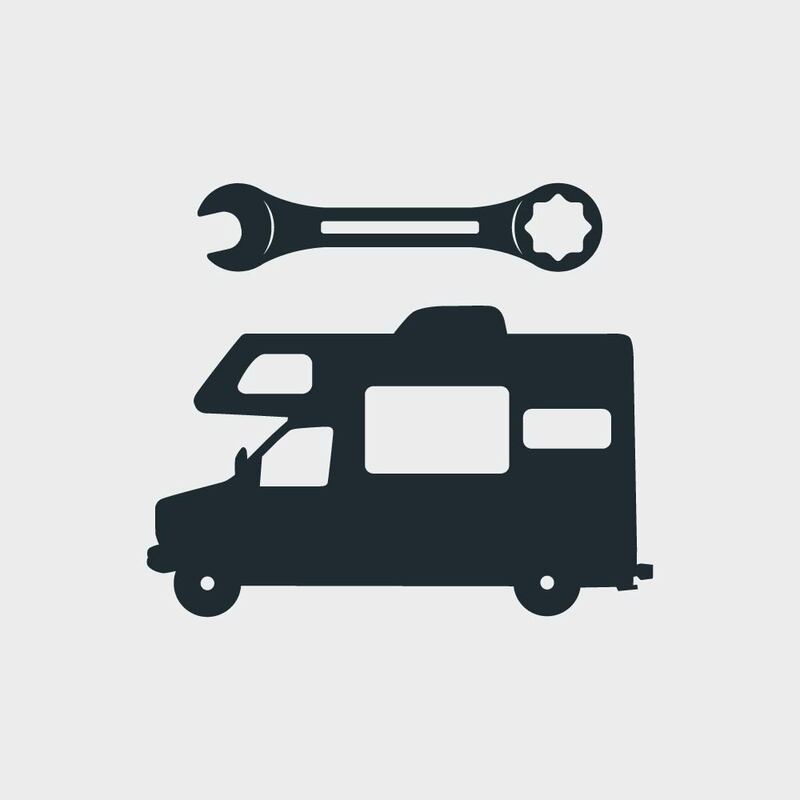 Here’s a simple RV maintenance checklist to get you started. No matter how protected your RV is while in storage, it’s bound to get a bit dirty. And before you take it out on the road, you’ll want to give it a good deep cleaning both inside and out. Wash the exterior with soapy water and rinse it completely. Then, inspect the decals for wear and damage. If you see any, consider taking it to your dealership for repairs. Inside the RV, vacuum, sweep, and dust all surfaces. Remove the cushions from your dinette and couch if possible and let them air out in the sun. This will kill any bacteria and mildew that might grow in the off-season. If you camp with hookups and running water, this step is not necessary. But if you ever rely on your freshwater tank, you’ll need to sanitize the water lines and the tank itself. Fill your water tank with fresh water and use a quarter cup of bleach for every gallon your tank holds. Let the bleach and water sit for a few hours to kill off bacteria. Then, run the water in each sink inside the RV. This will send the bleach water through the lines, killing any bacteria growing inside. Once the water tank is empty, dump the tanks. Fill the fresh water tank up again and let the water run through the lines until empty. Repeat the process until the water coming out of the tap no longer smells like bleach. The roof is constantly exposed to sun and those UV rays do a lot of damage to your roof seals. Take a moment to check the seams along your roof. It should still have a thick layer of sealant covering the gaps between your roof and the walls of the camper. If you notice any holes or see signs of damage, take the coach to your official Entegra dealer. They’ll be able to repair the sealant before you take it out on the road. The last thing anyone wants is to find a roof leak during the first rainstorm. Unfortunately, sitting idle isn’t great for your RV’s electronics. Before you hit the road, take a moment to make sure everything turns on. Run the TV, the microwave, the lights, and the fridge to make sure everything’s working properly. If something’s not turning on, check the breaker box and make sure nothing’s tripped. If the breakers are in good shape, it’s likely a blown fuse. Your dealer or local RV mechanic can swap the fuses out for you. Generators let you run your RV’s electric appliances even when you’re not plugged into shore power. But they need maintenance. Check the oil levels inside the generator. If it’s low, add the manufacturer’s recommended oil to the reservoir. Wipe the dipstick on a clean white paper towel. If the oil is light brown in color, you’re ready to test the generator. If it’s dark, it’s time for an oil change. You can do it yourself or let your mechanic change it for you. Remember, it’s best to change your generator’s oil after every 150 hours of use. Once you’re happy with the condition of the oil, run the generator for at least an hour. This will lubricate the system and make it easier to start up when you’re camping. A blown tire is every camper’s worst nightmare. And the most common reason is inadequate tire pressure. Check the air in each of your camper’s tires. If they’re low, fill them up as soon as possible. Not sure what the ideal tire pressure is? Check your owner’s manual. While you’re checking the air pressure, also check for unusual wear on the tire tread. Ideally, the wheels should show the same amount of wear in the same places. This shows that the tires are properly aligned. If the tread is uneven, it may be best to replace the tires. Head to your local tire center for recommendations. Your coach batteries power your rig, but they can deteriorate unless you keep them in good shape. Find the battery compartment and make sure there’s no corrosion on the connections. If you have a flooded battery, you’ll need to add distilled water to keep in working properly. Gently remove the battery covers on each unit using a screwdriver for leverage. Then, pour a small amount of distilled water into each reservoir. Don’t add too much—just make sure the plates are completely covered. You’ll be able to see the battery plates through the holes. Make sure they’re wet and replace the covers. Then, plug your RV in and let the batteries charge completely. Slides make any camper feel larger and give you more living and sleeping space. But their gears get a lot of dust, dirt, and grime inside anytime you’re out in the wind. Slide lubricant will help keep things running smoothly. And it’s easy to apply yourself. Pick up a can of lubricant at your RV supply store or the RV section of your local hardware store. Put the slide out and spray the tracks thoroughly. Then, pull the slide back in. This will lubricate the gear system and eliminate much of the grinding noise you’ve probably heard during your last camping trip. It’s easy to put routine maintenance off until the next camping trip or the next season. But with a little elbow grease, your RV will work better and last longer. Use this RV maintenance checklist as a starting point and add your own touches as you notice issues. Remember, every camper is unique and what your model needs might be different from others. Want a bit of help planning for your first road trip of the season? Check out these great tips that will take the stress out of travel planning. Next Post:What Does It Cost to Transport a Car Across the Country?